INDIANAPOLIS, May 25, 2018 – The U.S. Men’s Senior National Team is hard at work over the Memorial Day holiday weekend at its May national team training camp at the U.S. Olympic Team Training Center in Colorado Springs, Colo. Members of the current Junior National Team who are transitioning to the International Gymnastics Federation’s senior division and some recent senior national team members are also in attendance. 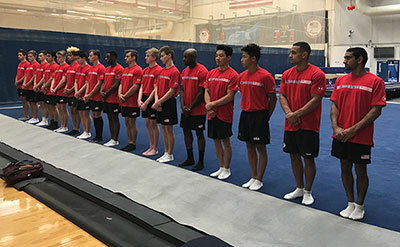 Under the guidance of Brett McClure, the men’s high performance director, the national team and their coaches are focused on acquiring new skills, and upgrading half-routines and sequences, as well as preparations for the 218 U.S. Championships in August and the World Championships in October. The coaching staff is also reviewing and updating the 2019-2020 strategic plan. The gymnasts attending the camp are listed below.